CampbellCameras.com has teemed up with Meebo™ to bring you and Campbell Cameras together. Meebo gives you the freedom to share. Whether you use the Meebo bar on CampbellCameras.com or on your favorite sites around the web, Meebo brings you and your friends together. Meebo: Together is better from Meebo on Vimeo. We are bringing you the opportunity to share anything on our website with your friends via Instant Messenger (Meebo, Facebook Chat, AIM, MSN Messenger), Facebook, Twitter, Yahoo, Buzz, or Email. You can even chat with your friends via Instant Messenger while you are on our site, allowing you to share products that you find and discuss them with each other. Or maybe you are searching our site and you can't find something or you have a question about a product or if somethings in stock, all you have to do is hit the "Chat With Us" button on the bottom menu and ask one of the Campbell Cameras Sales Staff a question! You also have easy access to see updates from our Facebook Fan Page, Twitter Feed, Blog Feed, YouTube Video, Filming Freaks site and our Camospace. 1. 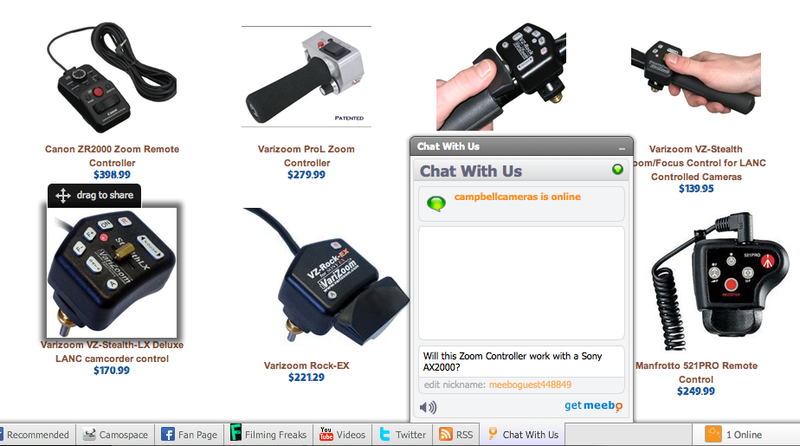 Meebo is located at the bottom of Campbellcameras.com. The menu bar will be there while you navigate throughout the site. (highlighted in green in the picture to the right). To access these tabs all you do is click on them. Some will open up on that page and some will take you out of CampbellCameras.com and onto a new site. • Share Page: You can share that entire page by choosing to Post it to your Facebook page, Post it to your Twitter Feed, Post to Google Buzz, Post to Yahoo Updates, Instant message it to one of your friends or email it to a friend. • Recommended: When clicked on it will pop open a tab on the website that will show you what people have shared via Facebook. This gives you an idea of some products that are highly recommended by other visitors of the website. 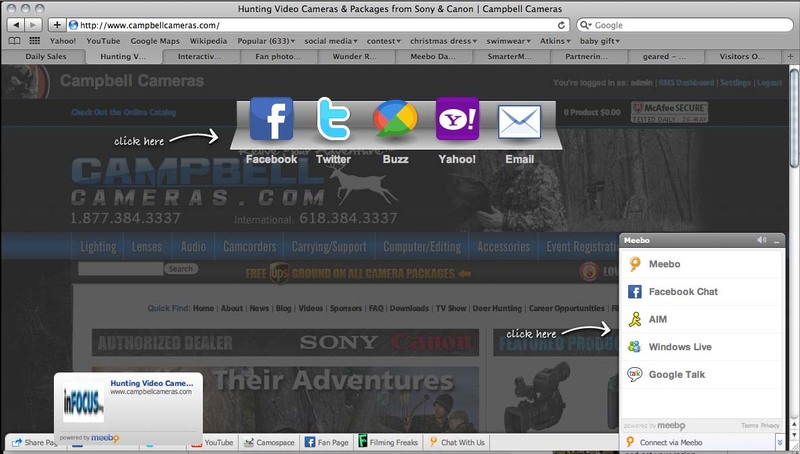 • Twitter: When clicked on, it will pop open a tab on the website that shows the latest CampbellCameras Tweets. This is a good way to be aware of new products that have been added to the site. This is also a location where you can become aware of deals, specials, Promotional Codes, and contest that Campbell Cameras hold! • Youtube: When clicked on, it will pop open a tab on the website that shows you the most recent YouTube Videos that Campbell Cameras/ Campbell Outdoor Challenge has posted. 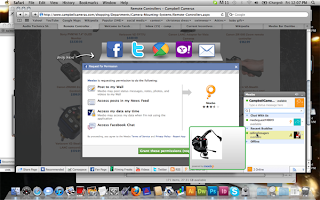 • Camospace: When clicked on, it will open up Campbell Camera's Camospace page in a new tab or window. 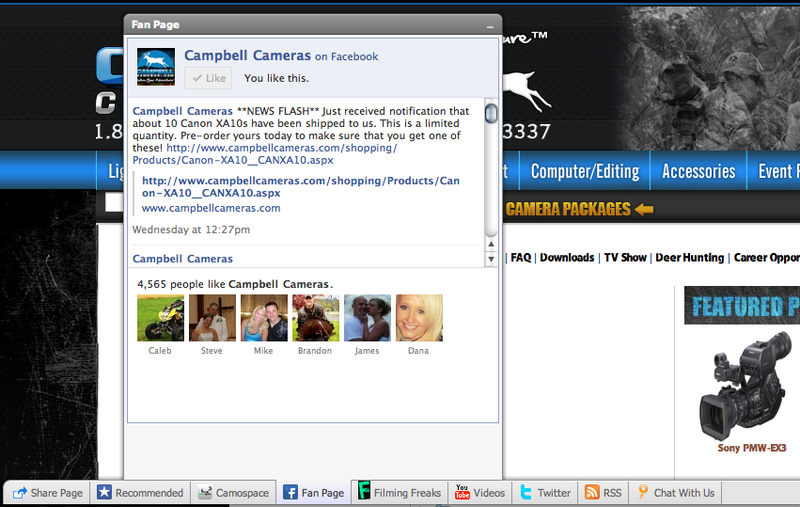 • Fan Page: When clicked on, it will open a tab displaying the latest Facebook Posts from Campbell Cameras, it also gives you the option to "like" our page, if you havn't already and shows how many other people have "liked" it as well. • Filming Freaks: When clicked on, it will open up FilmingFreaks.com in a new tab or window. Filming Freaks is a forum based website brought to you by Campbell Cameras. It is a great place to ask for other outdoor videographers advice on many different subjects, an outlet to by and sell your used equipment as well as find/post jobs in the outdoor industry. • Chat with Us: If you have questions while navigating our site, you can click on the "Chat with Us" tab, and if one of the Campbell Cameras staff members is online, then you can just type your question in! You can ask us a question on a certain product. See if one is in stock. Share a part of the website with us. Your options are basically limitless! • On the right side of the Menu there is a tab that will say "Connect via Meebo". When clicked on, you can sign in to your Meebo account, Facebook Chat, AIM, Yahoo Messenger, Google Talk, or MSN messenger. Once you sign in, you can click and drag anything on the site and send it to your friends in an instant message. You can also use that to chat with your friends as well. It is a great way to communicate with you outdoor partners while you are away from each other. • You can also highlight any text on the website and share that as well via any of the service. Item Reviewed: Understanding the new Menu bar on Campbell Cameras 9 out of 10 based on 10 ratings. 9 user reviews.